NES Battletoads & Double Dragon: The Ultimate Team (USA) in 17:41.14 by feos. 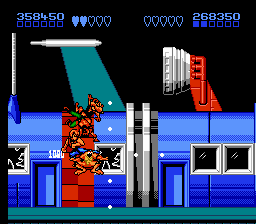 Battletoads & Double Dragon: The Ultimate Team is an action packed beat 'em up crossover that features essentially the same physics as Battletoads. Together, these heroes must defeat the Shadow Boss, the Dark Queen, and an assortment of other baddies. Unlike the run of the SNES version, the author, feos, uses both a Toad and a Dragon. In addition, he constantly exploits glitches removed in the SNES version. The result is roughly 18 minutes of ridiculous antics! For more information on the glitches used in this run, please see the author's notes.